Every good breeder will be willing to answer these questions. When you are ready to contact a breeder, you should be prepared to ask a lot of questions about the puppy or dog you hope to acquire. Here are some common questions that should be asked. Click on the questions to reveal our answers. What possible health problems might this dog develop? How big will the dog get? How old will he be before he acts like an adult dog? Your puppy will be very active for years 🙂 This is the breed standard. Teething will be over in a few months, growth for 1 yr, then filling out for another year. The color will change over the life of the dog. Toys, toys and more toys plus training is the key for a well-behaved dog or puppy. How protective will the dog be? German Shepherds are Naturally protective. It is because they are a loyal dog and they love their family. My advice is raise him/her as you wish for her to be. Socialize her a lot if you want her to be very friendly, or don’t let strangers meet her if you want her to be an alert guard dog. Study socialization books and videos in this area. There are many classes available to socialize OR for protection guidance. We can help you in this area. How often will the dog need to be groomed? German Shepherds rarely need any type of grooming. If you use a quality food (NO soy, corn, or fillers) just brush out the coat once in a while (including the 2 times a year they shed the undercoat). I do not bathe my dogs. They keep themselves clean. The only time your dog will smell is if they are left damp—getting them dry after a swim is the key. How does he get along with other animals? Your puppy should be getting socialized with people and animals while it is being raised. A good breeder will do this—then you take over with who you want to expose him to. We socialize our puppies with adults, children, and other animals before leaving our home. Your puppy will adjust just fine with any animals that are already in your home. Just watch that they don’t bully your new puppy. How long can he be left alone at home? A young puppy should not be left alone too long. But over time as the puppy develops, can hold his potty, and is learning how to behave in the home or is used to his crate, he can be left for longer periods. Eventually, if properly trained, your older puppy can be left for most of the day while you work or the kids are in school. How much exercise does the dog need? German Shepherds are active dogs. Puppies play and nap a lot. After 10 months of age, the dog can go jogging with you. They love to swim. We use toys like frisbees, flying squirrels, balls, Kongs, etc. to keep our dogs happy. After an hour of play he might just be ready for some couch time with you. What are the best training methods for this dog? German Shepherds are very smart. They learn very quickly to obey or “not” according to your training them. Determine what basic commands you wish to teach your dog/puppy. We start training your puppy to come and sit. When they leave, they are crate-trained and are used to a collar and lead. Please contact us for FREE printable training information on crate training, feeding schedule, and basic obedience if you have or are purchasing a puppy from me. Also please check out our training supplies information. There are free CD (podcasts) from Leerburg Kennel on Marker/Obedience/Puppy Training. Check them out for some of the BEST training DVDS! Your breeder should be willing to answer all of your questions fully. He or she should also ask questions about you, your lifestyle, and your family. If a breeder doesn’t respond to your inquiries, or doesn’t show any interest in the life the dog will lead after it leaves his or her premises, you may want to look elsewhere. 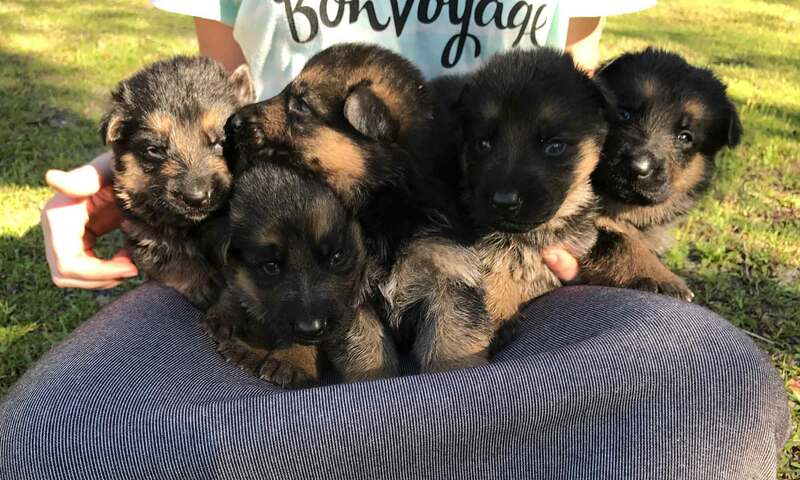 A responsible breeder or dedicated Rescue Group member is committed to making a good match between prospective owners and the dogs in their care; that’s the kind of person you want on your side as you make the journey into dog ownership. Do NOT use Trifexis!! It causes death in dogs and puppies. Bottom line: Always ask your Breeder first. They should be the most knowledgeable in the breed and the personality of the puppy you are getting from them.